I found the below photograph a year ago. The image haunts me. The photograph is a polaroid circa 1969. It was taken in June shortly after I started to present significant and alarming neurological deficits. The photograph has resided in a box of photographs I have not looked at in a very long time. I do not like to have my picture taken. I especially dislike any photograph of me standing, walking, running or in any typical biped motion. In fact, I have studiously burned every picture I can find of me standing. After I was born, I had the luxury of normalcy for almost a decade. Between the ages of 9 and 18 I was not so lucky. I had three massive spinal surgeries, spent a year in a body cast, had an untold number of spinal taps, I took prednisone and decadron almost daily. Medical technology was primitive at best. I experienced severe pain of the sort that no human should endure. Pain started in my toes and shot up like lightening bolts into my lower back and exploded like the grand finale at an epic fireworks show. This could go on for hours or days. I developed fevers that shot up to 106.8 f. I shook violently for hours and sometimes for as long as a day. The spasms in my back were so severe that my skin turned red and all the valium in the world could not get my muscles to unlock. I learned to embrace pain like a long lost lover. Pain has been my companion since I was a boy. We get along well. I cannot imagine life without my buddy pain. None of this bothers me. It was and remains a part of life. My life was one in which hospitalizations were the norm. Wards of 16 morbidly sick children were my home away from home. Scarsdale where my family lived, I quickly learned was fantasy land. In the famed Babies hospital I learned a different reality. In the winter saw men sleeping on the streets on card board boxes over the subway grates. I saw poverty out the hospital window over looking Broadway. I saw the gritty reality of Harlem. My peers told me about their dysfunctional families. I saw kids get a terrible diagnosis and was shocked that their parents never returned to visit them. Suffice it to say, I went through the medical mill. I suffered in a Biblical way. And thankfully my experience is a part of medical history. No child today will experience what I did. The photograph above haunts me. It does not haunt me because of what I endured as a child. It haunts me because of what was about to take place. 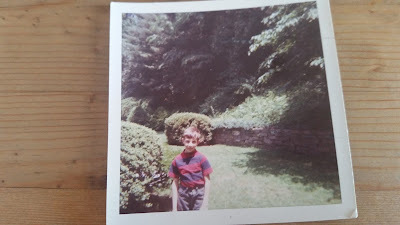 To this day, I vividly recall the back yard in the photograph. To the left would have been the large brick house I grew up in. It had a slate patio and screened in porch. To the right were woods and a steep hill. As I look forward there was a large red maple tree. In the woods stood a huge poplar tree I loved. I recall the striped red and blue shirt. It was my favorite. The photograph haunts me because society killed the sweet little boy I once was. I am no longer sweet. I am no longer innocent. I am no longer young. I am a badly damaged man. I am inherently wary of bipeds. I trust no stranger. I assume the worst of others. I have been spit on, pissed on and disparaged on a regular basis for nearly 40 years. Ableism is very real and it is lethal. An unfathomable number of people with disabilities have been killed by a society that is indifferent and often hostile to the existence of people with a disability. When paralyzed at 18 years old in rehabilitation I saw depressed men disappear. Depression was not permitted. The depressed were shipped off to locations unknown. I am haunted by the thought of where did these men end up? I have survived and thrived because I refuse to ever back down when confronted with baseless prejudice. Disability based prejudice abounds. Prior to the ADA, I had no rights. I did not have the right to a public school education. I did not have the right to get on a bus--any bus. I could not get on an air plane. I was deemed a flight safety risk. I could not legally go to public school until 1975. I was deemed a fire hazard. It certainly did not help that my mere presence was thought to be too upsetting to other children. The only sanctuary I had was my home and the hospital. To this day that feted smell one encounters when entering a hospital smells like home. I take a big deep gulp of air into my lungs and feel at peace. There were no bullies in the hospital eager to torture me. No one wanted to hurt the kid that was going through the medical mill and whose survival was iffy at best. I was with my people--sick children whose bodies were failing in a myriad of horrific ways. Most of the kids with severe neurological conditions died. I never talked about the future. I did not expect to have a future. I did not think I would be an adult. The toughest birthday I had was when I turned 21. I thought to myself--what am I going to do? I am going to become an adult. I was paralyzed and medically stable. My existence I quickly learned was an affront to typical others. Everywhere I went I was a problem--that is if I was lucky enough to find a building accessible. I was refused service in a multitude of restaurants. No wheelchairs I was told. I was told by professors that I was wasting a spot in the class. A non disabled student was far more deserving of an education. I was told repeatedly that it was unreasonable to think I could be employed. The bar was set low for a crippled man such as myself. I was ejected from more than a few sporting venues because they lacked any semblance of handicapped seating. I was once taken out of Yankee Stadium in handcuffs because I over turned a television camera. Many television cameras had replaced handicapped seating for the World Series. I was angry. I am still angry. I am a human being not a problem. Yes, society killed the sweet little boy pictured above. I am wary of all others. I am certainly no longer sweet. I am a bad cripple because I have been forged by disability based bigotry that remains rampant today. No longer am I told "no wheelchairs". Instead bipeds lecture me about how Grant Auditorium at Syracuse University is minimally ADA compliant. Overlooked is the fact hundreds enter Grant auditorium via stairs and sit where ever they desire. I am relegated to the disability ghetto all the way in the back in a far off dark corner. No one wants to hear about the utter lack of accessible housing. When I want to move delete 95% of all housing options. I do not visit friends homes. No one lives in an accessible house and that includes my siblings. The barriers I confront, both physical and social, are overwhelming. The little boy in the photograph had no worries. That boy wanted to be like Tom Seaver and pitch in the major leagues. That boy got on a school bus and went to public school. When that little boy was paralyzed in 1978 after a decade of enduring the medical mill society killed him and created a different human being. You reap what you sow. In the King James Bible I read "Be not deceived; God is not mocked: for whatever a man soweth, that shall he also reap". I am far from the only bad cripple. While I lost much bodily being paralyzed, I have gained and become a thorn in the side of bipeds and typical others. I have gained much. I have a people--disabled people. We form a disenfranchised minority group. Our rights are protected by the law. The laws that guarantee our civil rights are not valued nor respected. The law is broken on a daily basis. And thus I am one of many who fight back. To me, this is called disability gain. More than just having a people, I have met unique humans with very different bodies and means of thinking and ways of navigating the world. We know we are unwanted. We don't care. We know we are not a problem. We are human beings with inalienable rights. Violate those rights and ableists will reap what they sow. This is what happens when a person such as myself is forged by disability based bigotry. That sweet little boy has grown up to be a hard man forged of steel.